I love making pies! So many flavor combinations. Each one is a work of art, carefully crafted for your loved ones’ eating pleasure. Definitely an activity that makes me happy. Preheat oven to 450°. Line the unbaked pastry shell with foil and bake for 8 minutes. Remove from oven and remove foil. While shell bakes, make filling. In a saucepan, whisk eggs and sugar. Add butter and chocolate chips. Cook over medium heat whisking constantly until butter and chips melt and mixture is creamy and coats the back of a spoon (about 4-5 minutes). Stir in pecans and coconut. Pour filling into pastry shell as it comes from the oven. Turn oven heat down to 350° and bake pie for 20-22 minutes more. Serve warm or room temp with vanilla ice cream and a glass of milk! 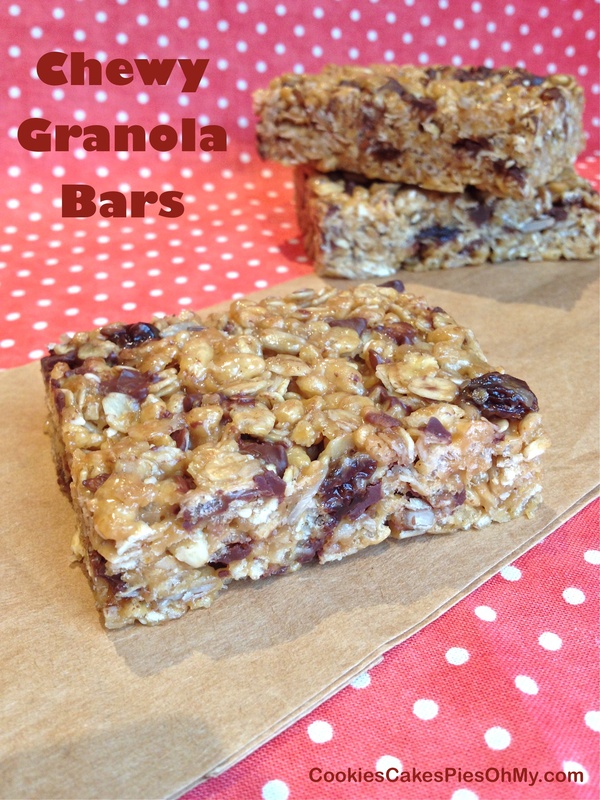 These granola bars are so easy to make, a perfectly delicious treat! 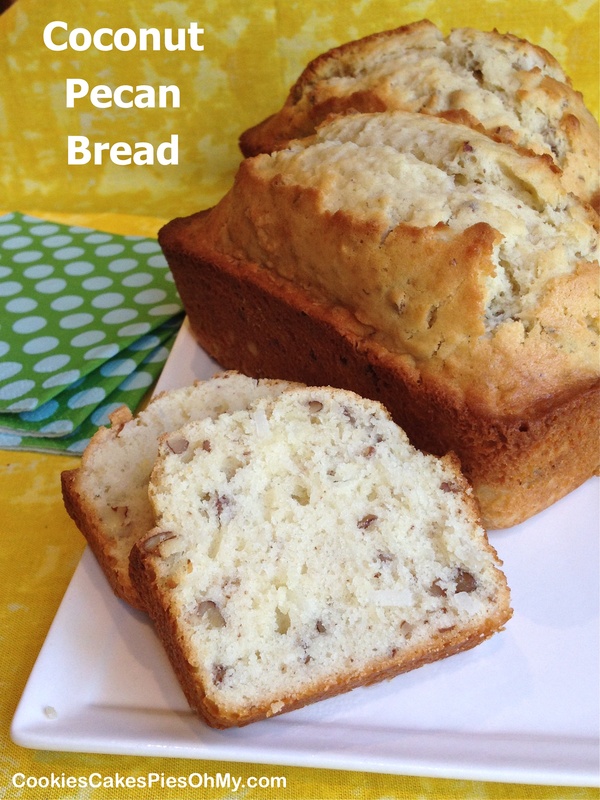 Recipe from moneysavingmom.com. Combine Rice Krispies, oats, wheat germ, and mix-ins in large bowl. In saucepan, mix honey, brown sugar, and salt. Over medium-low heat, stir until the mixture comes to a complete boil for 30-60 seconds. Remove from heat and stir in peanut butter and vanilla, mixing until smooth. Pour over dry mixture and stir until well coated. Let cool for 5-10 minutes then gently stir in mini chocolate chips. Press into sprayed 9″x13″ pan. Let cool and set up then cut into bars. Preheat oven to 375°. In large bowl with electric mixer, cream butter, applesauce, peanut butter, sugar, and brown sugar. Add egg and vanilla. In medium bowl, stir together flour, wheat flour, oats, Total cereal, baking soda, and salt. Mix dry ingredients into creamed mixture just until combined. 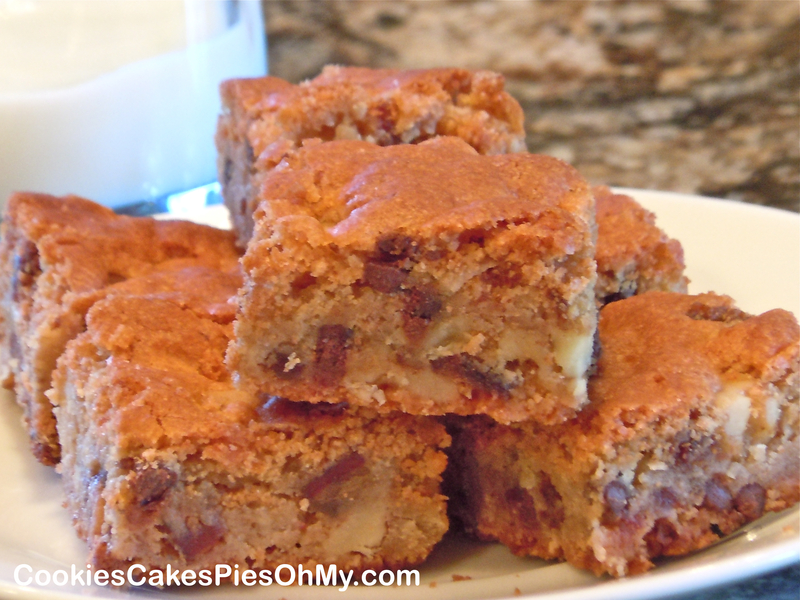 Mix in walnut, coconut, and mini chocolate chips. Drop 2″ scoops of batter onto silpat or parchment lined baking sheets. Press down with bottom of glass dipped in sugar to flatten to 3″ in diameter. Bake 7-8 minutes. Makes 32 cookies. 140 calories and 20 carbohydrates per cookie. I need a little something to take when I go visit a friend. A little loaf of bread is perfect! Preheat oven to 325°. In medium bowl stir together flour, baking powder, baking soda, and salt; set aside. In large bowl stir together melted butter, sugar, oil, eggs, and coconut extract. Add dry ingredients alternately with buttermilk to butter mixture, stir just until combined. Stir in coconut and pecans. Divide batter evenly between three well sprayed mini loaf pans. Bake 40 minutes or until pick inserted in center comes out clean. Cool in pans for 5 minutes, remove to cooling rack to cool completely. I believe this is the first time I have ever used a cookies recipe that uses oil. I was curious. 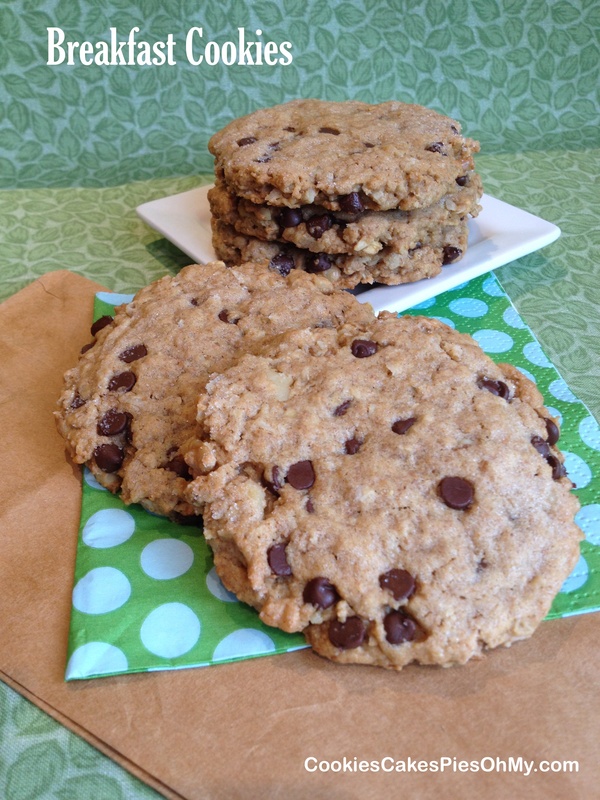 The end result is delicious, slightly crisp as you bite into it, then a tender chewy cookie on the inside. Simply yummy! Preheat oven to 350°. Line baking sheets with silpats or parchment. Stir together flour, oats, baking soda, baking powder, and salt. In another bowl, cream butter, oil, sugar, and brown sugar with electric mixer. Mix in eggs and vanilla. Add dry ingredients to creamed mixture, mix well. Stir in butterscotch chips, white chips, and coconut. Drop by scoopfuls onto prepared baking sheets, press down slightly. Bake 9-10 minutes. Cool on baking sheet for a few minutes, then transfer to cooling rack. Is it old fashioned to love custard? If it is, then call me old fashioned! 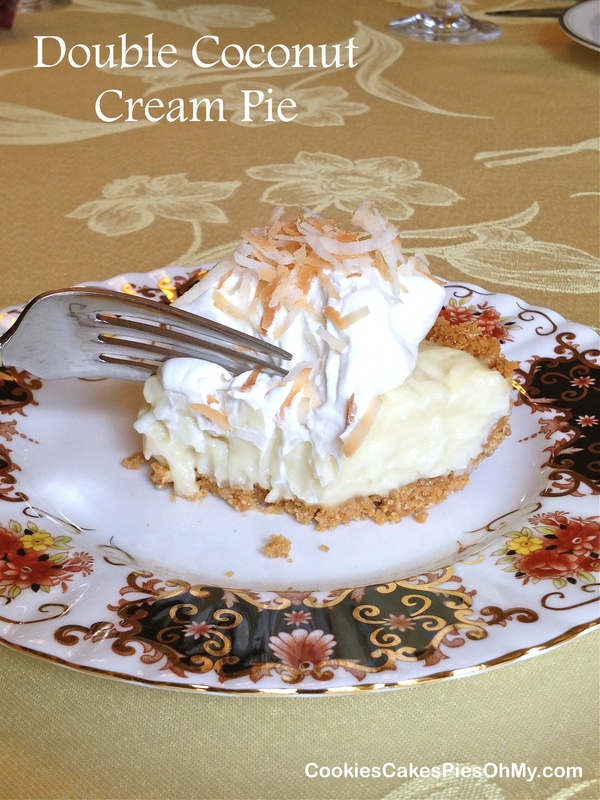 I love custard, the texture, the flavor…add coconut, put it in a flaky pastry and it’s perfect! 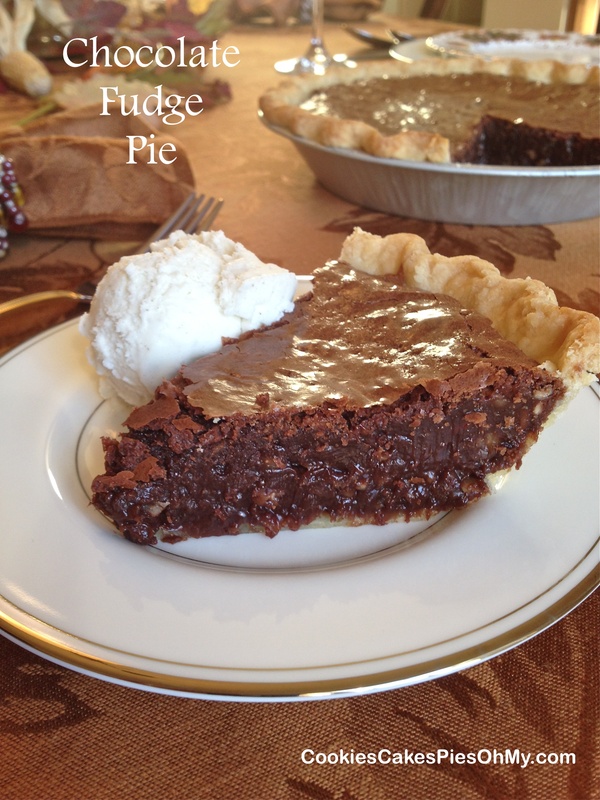 This recipe can be made into one 8″ or 9″ pie, I wanted to use my little individual pie plates I received from one of my daughters. The only problem I can see here is the guilt you feel when you realise you are only one individual who just ate two individual pies! Oops! Preheat oven to 375°. Stir half & half and coconut together in large bowl, set aside. 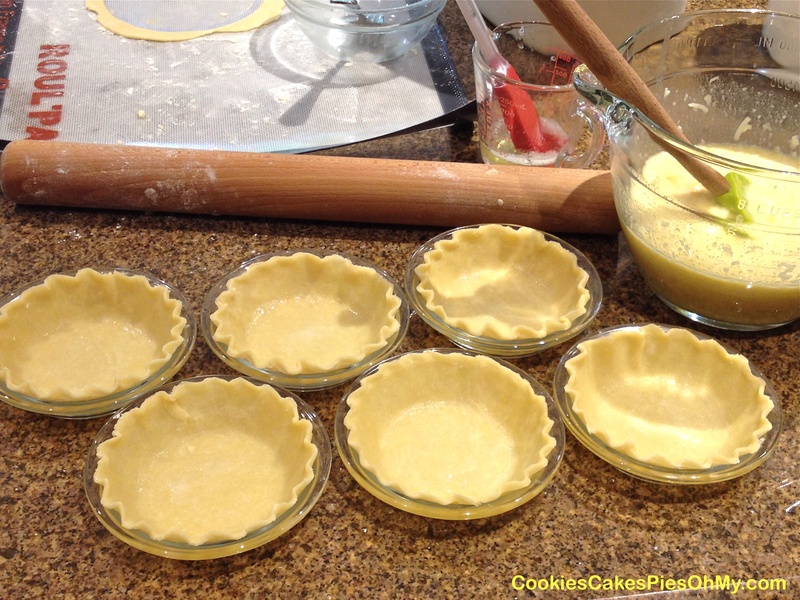 Roll out pastry, cut into six circles, fit into six individual pie plates, set on baking sheet, and set aside. Add the 2 beaten eggs plus the 1 egg yolk (will use the 1 egg white in a minute), and vanilla to the milk/coconut mixture, stir until combined. Stir in sugar, flour, salt, and cooled melted butter. Brush inside of each pastry shell with egg white. 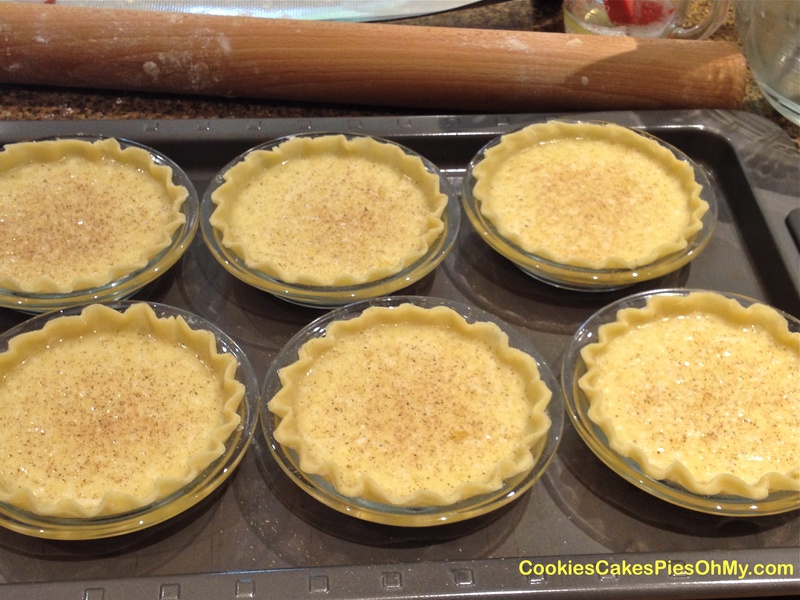 Distribute filling evenly into each of the six prepared pastries (approximately 1/2 cup). Sprinkle with nutmeg. Bake 20-25 minutes, until golden on top. Cool, then refrigerate. Serve with whipped cream if desired. *Can be made into one 8″ or 9″ pie. I’m a little obsessed right now with BIG cookies. 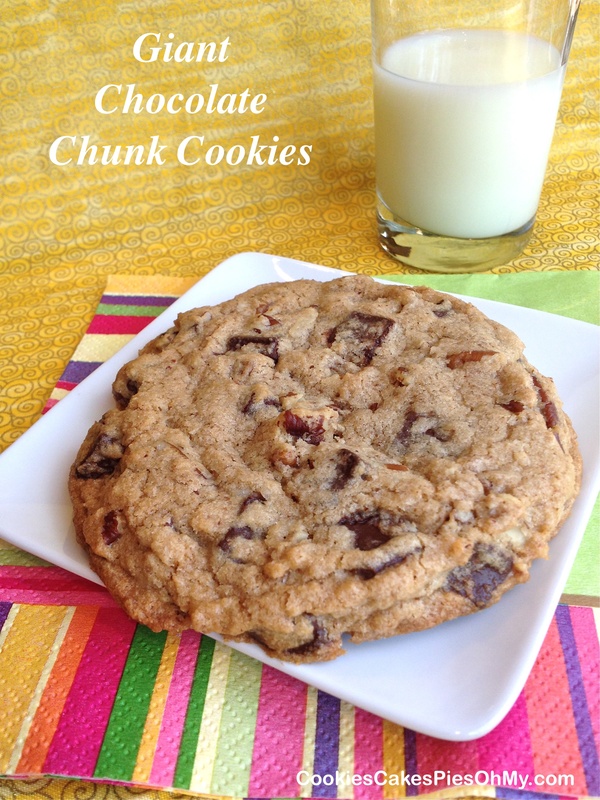 Yummy, 4″ in diameter, smile making, taste-bud pleasing cookies! Preheat oven to 325°. In medium bowl, stir together flour, corn starch, baking soda, and salt. In large bowl, cream butter, shortening, sugar, and brown sugar with electric mixer. Add egg, vanilla, and sour cream; mix thoroughly. Add dry ingredients and mix just until combined. Stir in chips, pecans, and coconut. Drop 1/4 cup scoops of dough onto silpat lined baking sheet, flatten to make 3″ diameter discs. Bake for 14-15 minutes. Cookies will be 4″ in diameter after baking. Makes 14 cookies. Combine coconut milk, cornstarch, salt, and sugar in large sauce pan. Heat to boiling over medium heat, whisking constantly. Add a small amount of hot coconut milk mixture to egg yolks to warm, and then add egg yolks to coconut milk mixture. Boil 1 minute stirring constantly till thick and smooth. Remove from heat and stir in butter. Cool for about a half hour, stirring frequently. Stir coconut into lukewarm filling. 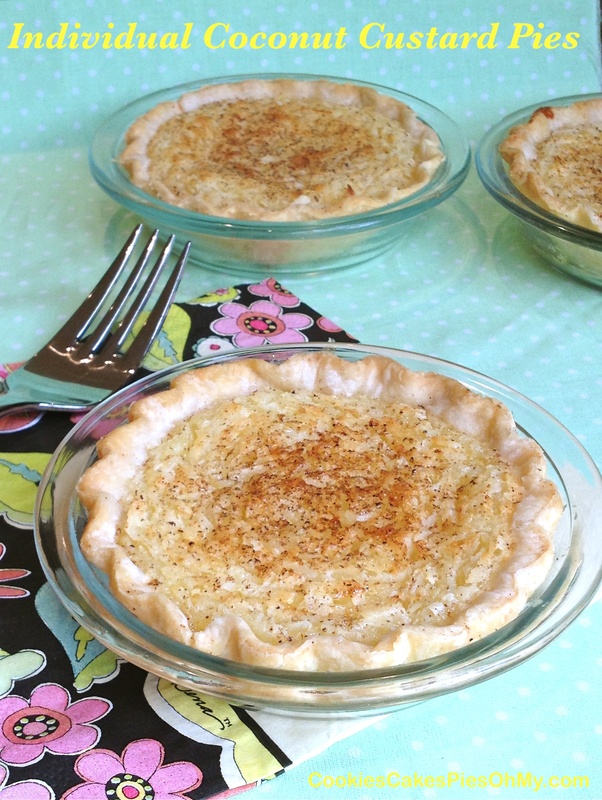 Pour into baked pie shell, cover with piece of parchment or wax paper. Cool completely in refrigerator. 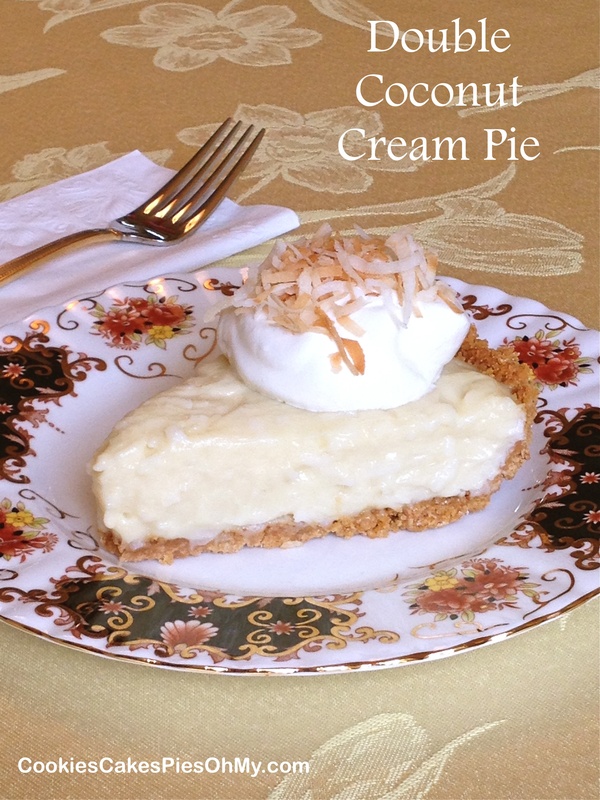 Serve with whipped cream and toasted coconut. Preheat oven to 375°. Line a 9″x9″ square baking pan with foil, leaving overhang; spray bottom and sides with nonstick spray. Melt butter in microwave. Whisk in sugar and salt. Whisk in egg, then cocoa and flour until smooth. Spread batter in prepared pan. Bake 10 minutes, just until sides begin to pull away from edges of pan (do not overbake). Let cool slightly while preparing coconut topping. Keep oven on for topping. Mix eggs, sour cream, sugar, and vanilla. 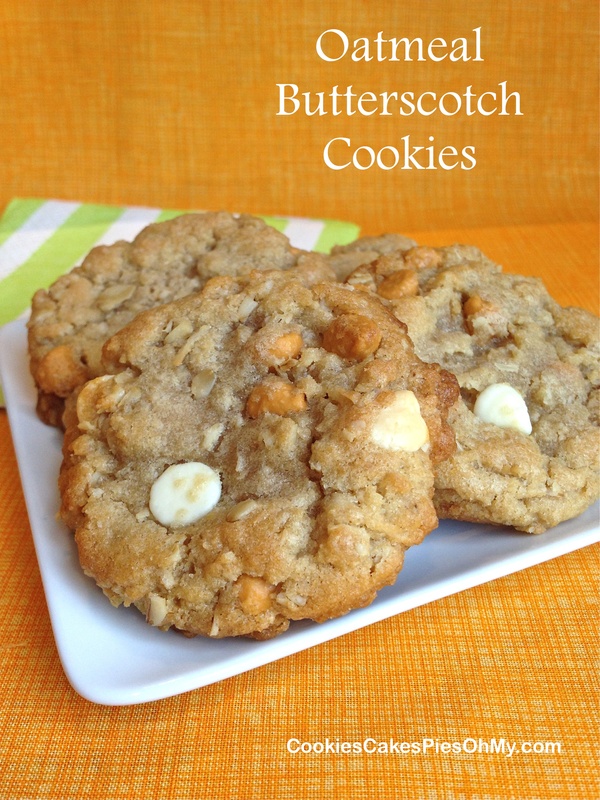 Mix in flour, 1 cup coconut (1/2 cup reserved for sprinkling), and macadamia nuts. 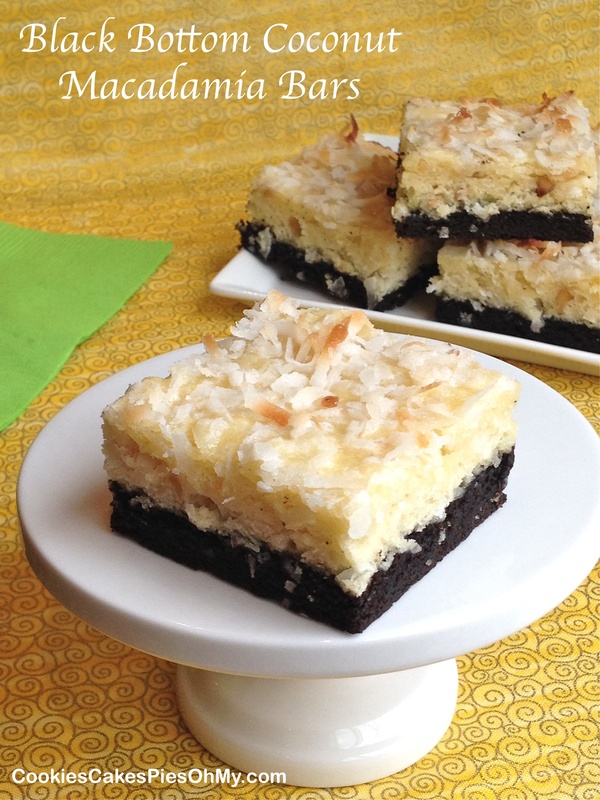 Drop spoonfuls of coconut mixture over chocolate base and gently spread to an even layer. Sprinkle with reserved 1/2 cup coconut. Bake 25 minutes until golden and center is set. Cool completely in pan. Lift cake from pan, peel off foil, and cut into bars.